Posture and Stability analysis and bio-feedback training. order the Posture Scale Analyzer now! A. Posture Scale Analyzer – Analyze weight distribution, balance and stability of patient. 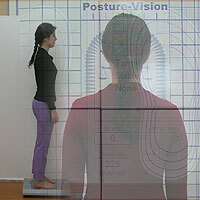 B. Posture-Vision – Analyze posture screening of the patient. Records weight distribution between Left & Right, Anterior & Posterior. Identifies patient's center of pressure during the test. Tracks dynamic behaviors: stability, sway rate and direction, fall assessment. Trains and educates patient to control and adjust their balance and stability. Enhances patient's awareness to their balance and stability. Clear graphical and numerical presentation of test results. Gives immediate test results and feedback (15 sec). Records patient performance and training scores. Provides a printout of test data. Enables export and import test data via email. Prior to treatment in order to determine the appropriate treatment. After treatment to indicate the effectiveness of the treatment. During the treatment process to indicate the improvement in patient's condition. The PSA provides statistical analysis of the tests performed on a single patient, on a group of patients, or all the listed patients. The data is organized according to date of tests, patient age, gender and in addition, in accordance to 6 different criteria that can be specified by the attendant. 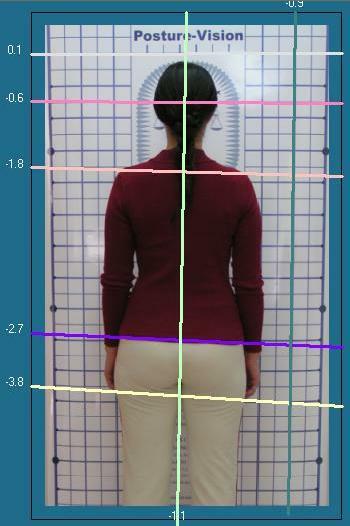 The Posture-Vision is a complementary tool to the Posture Scale analyzer. Used together the tools provide comprehensive evaluation of the Patient's condition.